What’s the first thing you look for when applying for a loan? The interest rate, right? The stated interest rate gets the most attention when we apply for a loan but it may surprise you that it’s not the true cost of your loan. The interest just from that annual rate doesn’t include fees and commissions and may not even include all the interest you pay. Just looking at the interest rate on a loan may mean you pay thousands more than you thought for that loan. The real cost of your loan is something called the Annual Percentage Rate (APR) and there are some huge differences between the APR and a loan’s interest rate. Technically, lenders must tell you the APR on a loan but they’ve gotten expert in hiding it either in the fine print or on the back of a loan document. They know that if you saw the APR, you might think twice about taking out the loan. Know the difference between the interest rate and APR and how much your loan will truly cost you! The interest rate on a loan is generally based on your credit score and other financial factors. The rate is a very basic measure of the cost of your loan…but it doesn’t include the full cost. The APR on a loan is based on your interest rate but also includes all the other costs of the loan and is calculated differently, depending on how often interest is added back into your loan. Those additional fees and interest compounding are going to make a huge difference in the amount of money you pay for your loan. The APR is the real cost of borrowing that money and it’s the one you need to be watching because lenders love to hide it. This is one of the reasons why I started this blog, to help people see the scams and cheats lenders try to use to put one over on borrowers. 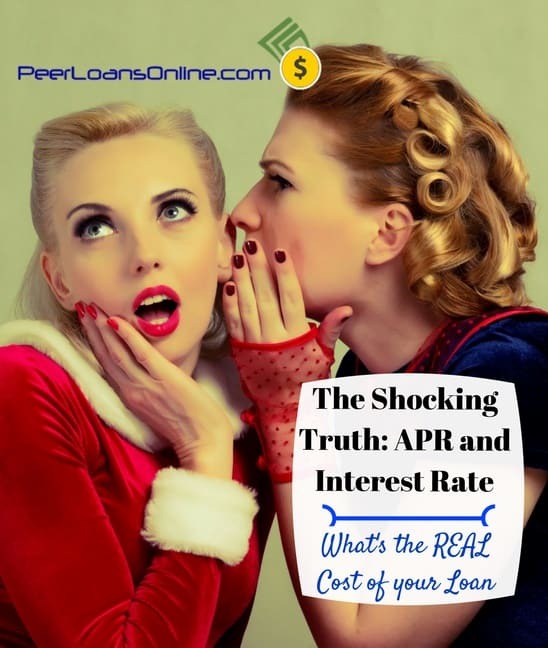 The difference between an interest rate and the true APR is one of the biggest ways lenders trick you. How is an APR Different from the Interest Rate on a Home Loan? Any time you apply for a home loan, the mortgage lender or bank is going to quote you an interest rate on the money…because it’s lower than the rate you will really be paying on the loan. By law, lenders must disclose the APR in a Truth-in-Lending statement. The APR on a home loan will also include the fees and commissions for buying the home. These extra fees will include closing costs, broker fees and the title costs. The extra fees on a home loan can easily add thousands on even a small loan and drive the loan cost up by a couple of percent. A $100,000 loan with $3,000 in closing costs or points paid by the buyer and an 8% interest rate on a 15-year mortgage is actually costing you 8.5% in interest (APR). That half a percent difference in the interest you actually pay might not seem like much, but it adds up to tens of thousands over your loan’s lifetime. If I told you spending just three minutes to understand the difference could save you $10,000…you’d be interested, right? Make sure you compare the APR on loans when shopping around for a mortgage. Don’t believe the lender when they quote that low interest rate. All this headache of comparing interest rates and APR is one reason I only recommend a few lenders on the blog, the ones with no hidden fees that increase your APR. When you’re looking for a personal loan, make sure you’re looking at origination and other fees and the effect on your rate. As if the difference between an interest rate and the APR was not bad enough, it gets even more complicated when talking about credit cards. The APR shown on your credit card statement is the interest rate charged annually but it’s not the actual interest rate you are paying. The APR doesn’t include the fact that interest is charged on a daily or monthly basis. For credit cards, you want to look for the Annual Percentage Yield (APY) which is the real interest rate you pay accounting for that daily interest charged. It’s in the fine print because credit card companies don’t want you finding it. For example, if you borrowed $10,000 on a credit card at an 18% interest rate then you might think you would be paying $1,800 each year in interest (0.18 * $10,000). Most credit cards charge interest on your balance every day. If you pay off the card at the end of your billing cycle then you pay no interest. If you don’t pay the card off then you pay all that interest calculated through the month. This means the APY is calculated by dividing the interest rate by 365 days and then multiplying that percentage against your daily balance. That same 18% interest rate means $4.93 of interest charged each day on that $10,000 credit card balance. It may not seem like much but it adds up and is a lot more than you may suspect. Without making payments on that credit card, that 18% interest rate will actually cost you $1,970 a year. You’ll need to make a $200 monthly payment on that credit card and will still pay $8,600 in interest for almost eight years. That difference between APR, APY and the interest rate you see on statements is a big reason why I recommend debt consolidation loans to pay off those high interest loans. Taking out one loan at a lower rate to pay off all your smaller loans can save you thousands in interest and make it easier to cover your bills. Consolidate those high rate credit cards with a personal loan. Click to check your rate instantly. All this talk about APR, APY and interest rates may seem like a confusing alphabet-soup of ideas. The fact is, it doesn’t have to be complicated or really even involve any math. Understanding the APR, the real cost of your loan, is a matter of looking for it in the fine print and ignoring the lower interest rate quoted. Knowing this, you can compare the APR on your loan with other offers to make sure you’re getting a good deal. Since the APR comes from the interest rate, plus fees and how often the interest is calculated, then it’s going to depend mostly on your credit score. That means an APR under 10% is generally considered good for most loans. Credit cards will range between 12% to 18% APY on a good FICO score and personal loans will be slightly below. There are all kinds of tricks lenders use to hide the real cost of a loan. The difference between the interest rate and APR can mean thousands in fees and interest on your loan. Understanding the difference and how APR is calculated is the only way you can make the right decision when it comes to getting the money you need.